DSSSB Welfare Officer Recruitment 2019: Candidates looking for the details regarding DSSSB Recruitment 2019 for various posts can now get them below. We have mentioned important details in tabular form. In case you need more specifications and more information please check the advertisement Pdf. The same is attached below. Total 204 seats are announced by the Delhi Subordinate Services Selection Board. These 204 vacancies incldues 7 posts namely Welfare Officer, Jr. Environmental Engineer, Lower Division Clerk, Jr. Lab Assistant, Stenographer Gr.II, Legal Assistant, and Scientific Assistant. Please go through the article below carefully and let us know if there are any queries regarding it. 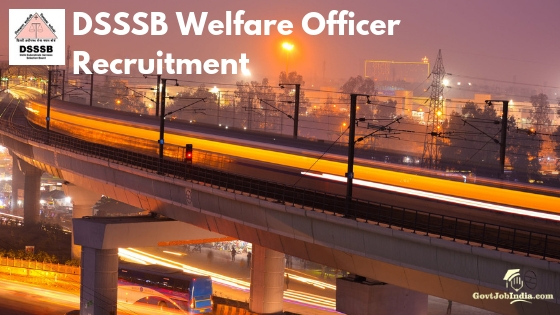 Important details regarding the DSSSB Welfare Officer Recruitment 2019 are all provided right here. You can know about selection procedure, eligibility criteria, application fee, and salary with compensation/grade pay. Kindly read them as per the post that is applicable to you. As each one of them needs separate qualification and experience. Click on the Apply Online DSSSB Welfare Officer Recruitment 2019 and fill up the application form. The last date to apply online is set as 5th March 2019 by the commission. Avoid last moment traffic and fill up the application form as soon as possible. Ensure that all the details and documents attached are legit. Clerk (27 seats) 12th pass or equivalent qualification from a university or recognized Board. Degree in science from recognized university/board. Experience: 3 yrs in lab work. Experience: 3 yrs as Legal Practitioner or 1 year Legal Work in Govt dept. 3 yrs contribution in pollution control activity. Pass in Hindi subject of Secondary level. All the applicants are requested to check the official DSSSB Welfare Officer Recruitment Advertisement Pdf to know more. Candidates are requested to check the official advertisement PDF to know more about the age relaxation details. They are mentioned in the Point Number 6 of Page 5 on the advertisement PDF attached below. How to Apply for DSSSB Welfare Officer Recruitment Online? Please visit the official website for registration @ dsssbonline.nic.in and read the “instructions to apply online” before filling the form. Register before applying and if you are already registered please enter the login credentials. Enter the details carefully along with the visual code and sign in. Fill in the application form and ensure that all the documents are attached as per the details mentioned. Apply before the last date – 5th March 2019. Submit application form and pay the exam fees through online pay modes. Candidates are requested to read the complete article carefully. We hope they all prove to be helpful and important. If you have any questions or doubts regarding DSSSB Welfare Officer Recruitment 2019, mention them in the comment section below. Our team will surely get back to you. All the best!